I wish I could have written this last article BEFORE the SCG Open last weekend so I could start talking about standard this week, but I was busy procuring cards for my standard decks, play testing, shopping, and also working and I never had more than an hour or two to relax. I promise today’s article about multicolor won’t be too long though, and I’ll have some pre-release/draft results for you too to look at at the end. The only land you need to worry about in KLD limited is Aether Hub. With a large variety of energy effects to choose from in all of the colors, having an extra energy floating around for an extra trigger activation in a pinch could save the day. 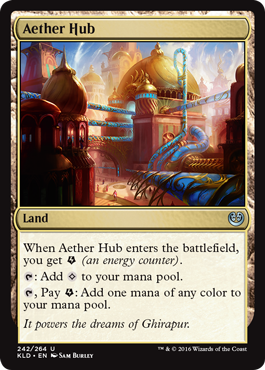 And of course Aether Hub is a great card to have if you’re trying to build a Naya or other 3 color energy deck since it shores up your mana fixing. Good card to have in limited, even if you’re only playing a few energy cards. I think it’s a good card to draft early. Not all cards are worth splashing, but if you get Voltaic Brawler I’d highly recommend it. Whether you’re playing R/x or G/x, it’s worthing splashing that other color to cast him, even if it means playing Prophetic Prism and Aether Hub. He gets 2 energy when he enters the battlefield, meaning you’ll get at LEAST 2 attacks with a 4/3 trampler before he returns to being an energy-less 3/2. Amazing card for energy decks. I wouldn’t take it first in draft, but I’d get it early and try to splash it in if I ended up being anything but a GR Energy deck (which it would be bonkers in). 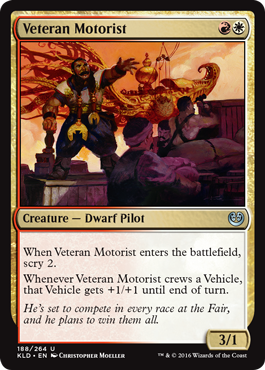 I don’t know about Voltaic Brawler, but Veteran Motorist is most definitely standard constructed playable. After a weekend with multiple RW decks in the top 8 of the SCG Open, the facts back it up. If it’s constructed playable, then it’s definitely going to be amazing in KLD limited. It hits extremely hard early in the game, lets you set up your draws for the next 2 turns, and it makes even cards such as Sky Skiff hard to deal with. You’ll definitely be playing a few vehicles in your deck, and this is the perfect driver since he can drive almost 80% of the vehicles himself. A 3/4 Skiff, 7/7 Ballista, a 6/5 Freighter . . . move over, he’s driving :D. High draft pick, splashable. 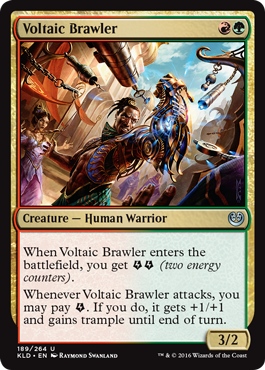 I don’t think that UG Energy is that strong of a deck, so Voyager will probably end up being a splash in a GR energy deck (unless your mana fixing supports Temur). It’s a great card for keeping the energy coming to supply your various ‘designs’ or strategies, and if you have ways to pump up it’s power with cards such as Fabrication Module he could become extremely dangerous. Flyers are also very good in this format, so I would consider playing him as a splash if I was close to his colors in a energy deck. The Gearsmith has a decent body and the mana cost isn’t too high, but what really does it for me is the ability. If I’m willing to pay 6 mana to play Dukhara Scavenger to put a card back on top of my library, I would definitely pay 4 for the Gearsmith. This is a great card to have alongside vehicles since you can send one off on a one way attack then get it back with her and have her crew it the following turn. Of course you can get a creature back as well so I don’t really see any reason not to play her. Early draft pick, worth splashing. 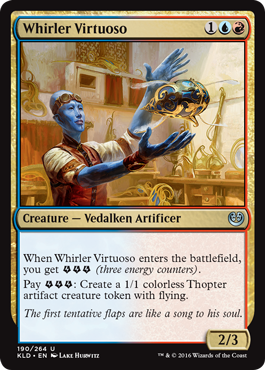 Whirler Virtuoso is a decent creature by himself, but gets a lot better with multiple ways to farm energy. 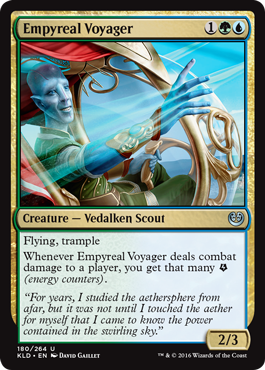 Without a card like Fabrication Module, Empyreal Voyager or Decoction Module it would be hard to take advantage of his ability. 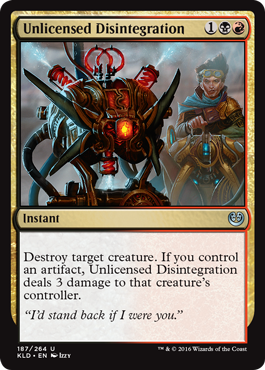 Speaking of Decoction Module, I think this would be a good card to use along with that and lots of Fabrication abilities/token makers so that whenever you play a creature you get an energy back making it that much easier to cast. Playing any card with Fabricate 2 would give you enough energy to put another Thopter into play right away. I think there is a deck he could fit into and be strong in, but most of the time you’ll probably be considering him for that 23rd card slot. Flyers are good, and while I like BW the best, UW is just as good and gives you a lot of card advantage. 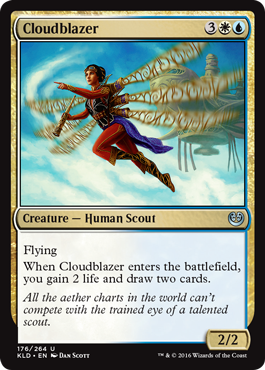 UW Flyer decks give you a lot of tempo and you can maximize their card advantage by throwing in a few bounce effects like Aether Tradewinds or Acrobatic Maneuver. A 2/2 body isn’t that great, but 2 cards is and the 2 life is icing on the cake. I would think it’s worth a splash in a U/x or W/x deck. Not super high in draft, but after pick 4 or 5 it definitely won’t table and make it back around to you. Why do I feel like I’m playing with Terminate when I see this card? Pretty cool art, and a powerful effect. Red doesn’t have any Fabricate effects, but black certainly does which helps when you want to get that 3 damage bonus in on top of destroying a creature. Great card for splashing, easy to cast, and instant speed. I’d draft it high and work in the splash later. GB or BW plus a red splash seem like they could work well. 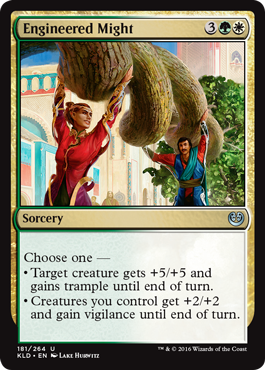 With all of the Fabrication effects throughout the colors creating an army of tokens, I’m kind of bullish on ‘Overrun’ effects that give every creature on your team a boost of power. It’s not as good as say Inspired Charge, but it will have generally the same desired effect. The other mode is nice too, especially if an opponent is tapped out and you have a finisher on the table like the Aradara Express (13 damage. Ouch). It won’t fit in every deck, but it’s worth considering. Hazardous Conditions – good board wipe against token based decks with a deck with a lot of small fliers. If you have a card like Durable Handicraft on your side it could end up being rather one-sided. Contraband Kingpin – good blocker, helps you to improve your draws, but only really good if you’re playing a lot of artifacts and want to get to your finishers/bombs quickly. Since the pre-release last weekend I was able to do 4 games of limited total so far: 3 sealed events and 1 draft. I was a little slow on evaluating cards leading up to the pre-release, but by the time the weekend rolled around I thought I was prepared. Down below you can see the decks I played, my results, as well as any observations I made during the tournament. My first outing at a 68 person midnight pre-release was with BW. The deck had some good removal and solid combat tricks but the curve was a little high. Fumigate was great and I was able to cast it multiple times during the night, but games went long because I wasn’t able to finish off my opponents quickly and they weren’t able to kill me because of my removal. I really liked Ovalchase Daredevil and Conti, and having 2 Fragmentize in the SB was also useful in a lot of my match ups as they acted like super cheap removal most of the time against artifact creature heavy opponents. I beat UWR energy in round one 2-0 thanks to constant beatdowns from Ovalchase Daredevil, but tied my next two games 1-1 each against UW and BW. My opponents played slow in both match ups (which is understandable since its a new set), but I also didn’t draw my removal early enough which let them stay in the games and get a win from me. I won both of my game ones in those two ties and think I would have one both of them had I a few more minutes to finish the match. There were only 3 rounds so that they could fire 2 more events in succession. My first observations about KLD limited was that I was able to play a lot more artifacts than I thought I could at first glance. This opened up a lot of strategies that revolve around having artifacts in play or playing artifacts to trigger something. My second observation was that vehicles worked really good as beaters/finishers when your pool didn’t have any bombs in them. If you have a fast deck with lots of 2 and 3 drops but no cards to push through a 5 or 6 toughness wall you’d be in trouble. And that brings me to my 3rd observation; flyers are incredibly powerful in this format. You either have them or you die to them. If you can’t kill or stop flyers, you will most likely lose the game to those players that have them. I did much better at Saturday afternoon’s 54 person, 6 round tournament at Amenity Dream in Osu. I went with BW again because it had the best removal, but mostly because of the number of flyers it had (5). The curve was much lower than the midnight deck’s and this allowed me to play faster and finish out games much more quickly. The Caravan and Barge ended up being great beaters on the ground while I was able to go over my opponent’s heads with the bat and the 3/2 Thopter with haste. I lost against a Jund energy deck in round 1 due to him being able to give all of his creatures haste with Spontaneous Artist and me not being able to draw any kind of pressure early. I won my next 2 rounds against a GR Energy and GW deck though. The GR deck was tough to beat as it had the energy Hydra and the Aradara Express, but I was able to clog up the board with tokens and then take the to skies to finish him off in game 3. In round 3 my opponent played a turn 4 Nissa followed by a turn 5 Verdant Gearhulk and obliterated me in game 1, but I fought back with a fast curve into vehicles and flyers in the next 2 games to win it. In round 4 I lost to a UW deck due to a mulligan to 5 which gave him the edge, but I closed out strong with 2 more wins against RW Vehicles and another GR deck in rounds 5 and 6. I finished in 15th place which wasn’t bad, and the observations about flyers and the interactions with artifacts seemed to hold true. I was much happier about my performance but still hungry for more so I was set to return on Sunday for one more pre-release. Black had been following me around all weekend and it ended up doing well for me again. I had incredible synergy with this deck. The Smuggler’s Copter was a great pull and helped me to deal damage early as did the Snare Thopter, but what really surprised me in this match up Marionette Master. I was able to Fabricate tokens to my hearts content and watch them die with glee when I had 3 counters on my Master. The constant drain of life + flyers made most of my opponent’s fold quickly. Another great card from this pool was Eliminate the Competition. It acted like a mini-board wipe most of the time, letting my sacrifice all of my servo tokens (and draw my opponent with the Master) while killing any and all creatures of importance on my opponent’s side. The small energy synergy also shared the spotlight from time to time. There were only 35 players at this event, but still a lot of competition. I beat UB energy in round 1 mostly because my opponent played more removal than creatures so as soon as those cards ran out he was in trouble. Another UB energy deck in round 2 gave me a run for my money as Aethersquall Ancient helped him to steal a game from me, but my flyers and removal managed to keep him backpedaling until I could finish him off. I beat a Jund deck after that which was able to go over my head for once with Skyship Stalker, but couldn’t deal with cards like Eliminate the Competition when they cleared his board of most of his creatures. I followed up that game with a win against an opponent I forgot to write a memo on, and then won my final match against RW thanks largely in part to early plays of my Smuggler’s Copter and holding him off with my removal. I ended up finishing in 2nd place on breakers, but still got a decent prize pay out. After a weekend of standard I also got my first taste of KLD draft. I finished 2-1 with BW flyers in a pool that was incredibly heavy in black and white (there were 2 other BW players in my pod). I had used what I had learned in the pre-release the week before and focused on build a deck around flyers to go over my opponent’s head. I started off the draft with a first pick of Fumigate, then focused on getting removal and flyers to fill out my curve. I was lucky to get my pick of the colors as the other BW players didn’t seem to get all that good of stuff. My only loss came in round 2 against an aggressive UR deck, but I beat Naya energy and BW to finish in 3rd place. I curved out really well with this deck and the anthem effect was really good with all of my Fabricate tokens. Thanks for reading this season’s Playing To Your Weaknesses and I hope you’ll join me again in a few days to start talking about standard as well as looking into investment opportunities before the Pro Tour. At 10-1-2 in KLD limited so far I’m feeling pretty good with my evaluation skills, but I couldn’t have improved this much without help from my 2016 GP Kyoto teammates Sarah and Kalim whose insight and discussions helped me to expand my thinking about building decks in limited and evaluating cards more efficiently. I look foward to drafting more and doing some sealed for next season’s PPTQs!